Fife Window Cleaning Services use a variety of window cleaning methods to ensure the highest standards and most effective way of cleaning windows in Dunfermline, Kirkcaldy and Glenrothes. We are one of the few operatives in Fife to offer a hot water window cleaning system. As standard we clean all frames, sills and doors at no extra cost. This is very important as window seals and frames can harbour dirt and mould, something that not only makes the UPVC look dated and worn; but can also lead to perished seals and such like. This can impact levels of condensation within double glazing. We have the equipment to clean awkward and hard to reach windows; for example when managing those located above conservatory roofs, we use telescopic water fed poles which supply purified water. Purified water is deionised through a vessel, meaning all minerals have been removed and this then leaves a clear finish when the water dries on the glass. The fact this system can be heated is a real benefit on the first time we visit you, as the finish on the glass can be achieved much better with warm rather than cold water. 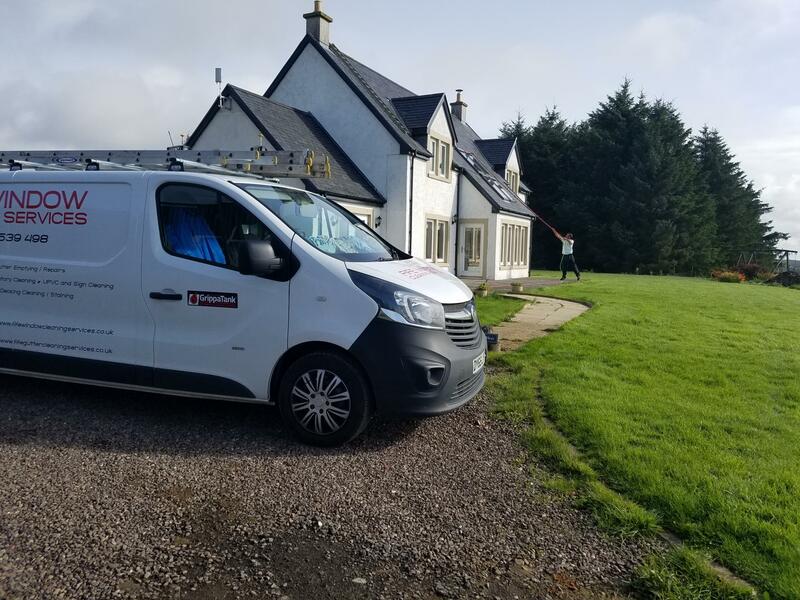 The above enables us to provide the most comprehensive window cleaning service in Fife, and able to clean previously inaccessible areas of your home or business. We are professional window cleaners in Fife and have public liability insurance cover. This important piece of insurance covers you for accidental damages, and we are a registered window cleaning company with Fife Council- our identification number is 0034885. Our use of both traditional window cleaning methods by hand and the more modern purified water system are both relied upon depending on the job; using the reach and wash system allows us to operate from the safety of the ground, also this method means a quality service is provided whereby we have the ability to reach difficult and high level windows up to several storeys in height. We are exterior cleaning specialists equipped to clean house and building facia, soffits and cladding , gutters , solar panels and conservatories. Our pressure washing for outdoor areas such as driveways, patios, mono block and decking is the best value for money and professional pressure cleaning service in Fife. Call us now on 07856 539498 or email using the Contact Us page for a free no obligation quote or further information.